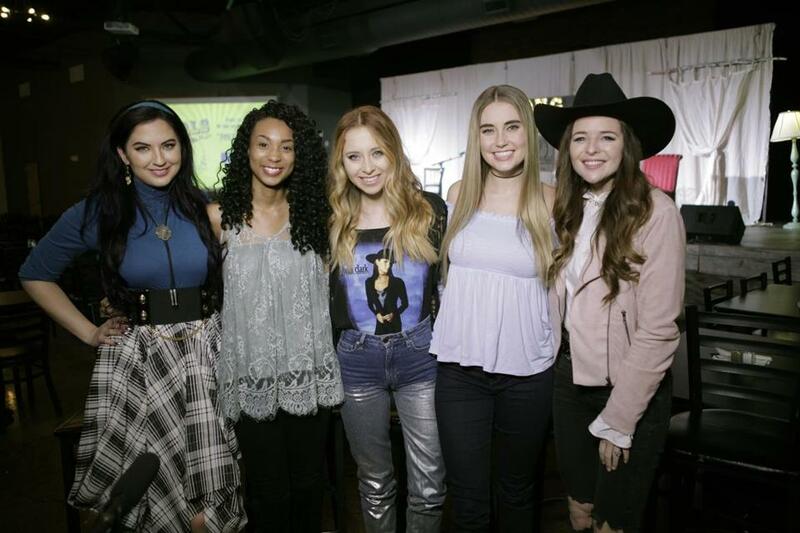 From left: Candi Carpenter, Tiera Leftwich, Kalie Shorr, Chloe Gilligan, and Jenna Paulette are among the members of the Song Suffragettes. The Song Suffragettes was formed in 2014 in response to a growing concern that women were being excluded by labels and radio and spurred by comments by a radio consultant that compared women to tomatoes in a salad. Only 18 out of the top 100 country singles of 2017 had a female artist featured, a percentage that has been stagnating in the genre for years. Kalie Shorr is one of the original members of the collective that plays in a writer’s round every Monday night at the Listening Room Cafe, just a couple of miles away from Music Row. But Shorr and her fellow singers said the #MeToo and Time’s Up movements that started in Hollywood and spread to other industries is a critical step forward in a conversation that has always been a secret in many industries. Shorr, along with fellow Suffragette singer Lacy Green, were inspired to write ‘‘Time’s Up’’ after watching the scores of actresses dressed in black at the Golden Globes. The music video for ‘‘Time’s Up’’ features the 23 singers dressed all in black, linked arm in arm, singing lyrics like ‘‘The scales are tipping, the veil is ripping and the clock is ticking ’cause the time’s up.’’ Proceeds from the sale of the song will go to the Time’s Up organization, which has established a legal defense fund. It’s one of the few signs that more artists in country music are willing to address sexual harassment. Keith Urban played a song titled ‘‘Female’’ on the Country Music Association Awards last November that seemed to address the #MeToo movement. The Country Radio Seminar, an annual gathering of the top country radio stations in the country held this week in Nashville, will have a panel on sexual harassment. ‘‘It’s one thing to see artists come out about it, but actually a few weeks ago, one of my family members came out and said that she had been sexually assaulted,’’ said Tiera, who goes by her first name as an artist. They agreed that the Grammy Awards last month missed an opportunity to highlight the work of female musicians. The Recording Academy came under fire for comments made by President Neil Portnow that women needed to ‘‘step up’’ after only two women won awards during the telecast. Shorr said while she loved Kesha’s performance of ‘‘Praying,’’ she said the Recording Academy should have given Lorde, the only woman nominated for album of the year, a performance slot.